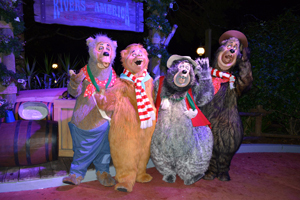 New for this year – and not just at Mickey’s Very Merry Christmas Party – is the Jingle Cruise (below, left). 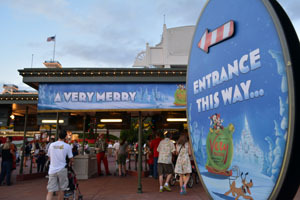 The skippers tell Christmas themed jokes, and the queue is decorated (below, right). There isn’t a lot more to it, but hopefully in the future! 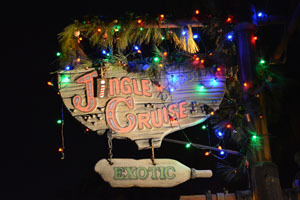 Video #1 – Jingle Cruise Christmas Overlay of the Jungle Cruise at The Magic Kingdom, Walt Disney World – Walt Disney World is offering a holiday overlay this year of The Jungle Cruise attraction. 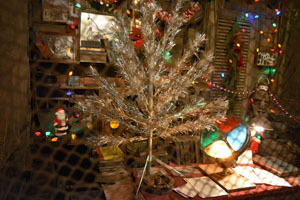 It isn’t much of an overlay on the ride itself, but the skippers tell Christmas jokes and the queue is decorated. Our skipper was great! 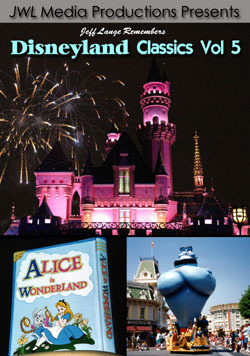 We do hope that eventually, decorations will be added to the ride itself. 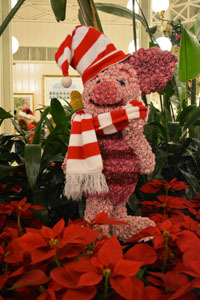 There are quite a few characters to meet at Mickey’s Very Merry Christmas Party! 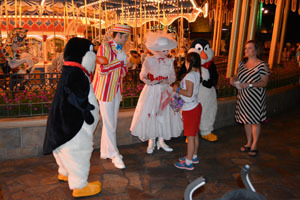 Mary Poppins is with Bert and the two penguins (below, left). We met Scrooge McDuck with Donald and Daisy Duck (below, right). 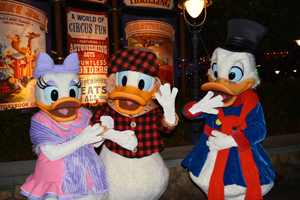 Video #2 – Donald, Daisy and Scrooge McDuck Meet & Greet at Mickey’s Very Merry Christmas Party, Magic Kingdom – We met Scrooge McDuck, Daisy Duck and Donald Duck at Mickey’s Very Merry Christmas Party 2013! 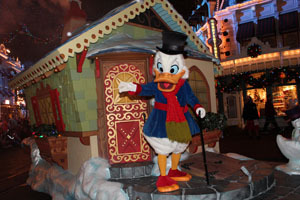 I tried to give Scrooge some cash for his money bag but he didn’t keep it – not very Scrooge like. 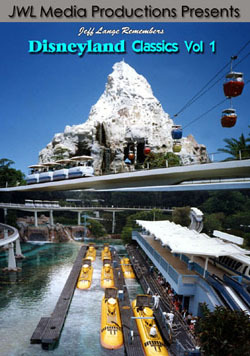 Treat stations are positioned all around the park (below, left). 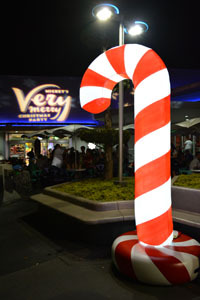 The candy cane is the new treat symbol! 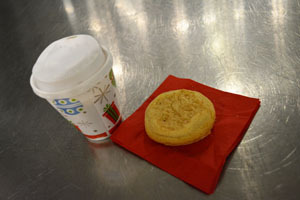 We enjoy visiting the Crystal Palace for cookies, hot chocolate, apple slices and apple juice – all included with the Party ticket. The Crystal Palace is only open from 9 p.m. – 11 p.m. but is decorated very nicely, including Pooh characters in their winter outfits! 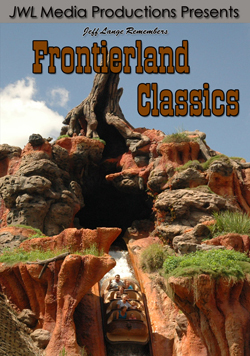 The Country Bears all meet in Frontierland (below, left), and Genie meets with Jasmine – or by himself, in Adventureland (below, right). 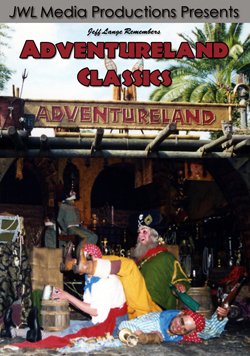 Aladdin and Abu also meet in that location for Mickey’s Very Merry Christmas Party. Video #3 – Genie, Aladdin, Abu and Jasmine Meet & Greet at Mickey’s Very Merry Christmas Party, Magic Kingdom – There are great characters out during Mickey’s Very Merry Christmas Party! 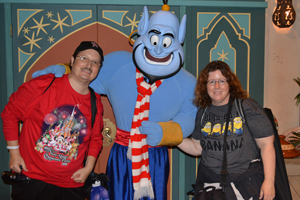 We met Genie while there, and Abu, Jasmine and Aladdin were all out at various times of the night in Adventureland. 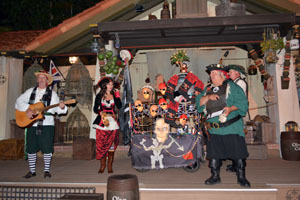 There is entertainment all around the park, including the pirate themed band, Rusty Cutlass (below, left). 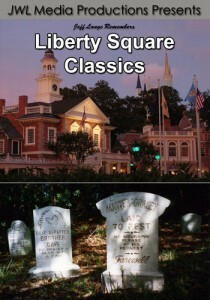 They are a favorite of ours! 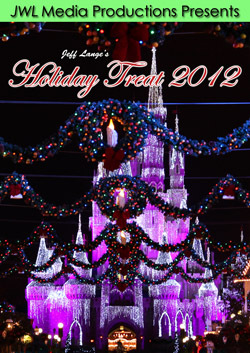 And Holiday Wishes is spectacular, with 360 degree fireworks (below, right). 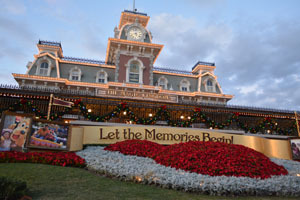 We enjoy taking photos of Mickey’s Once Upon a Christmastime Parade from Christmas Tree Point in Town Square (below, left). 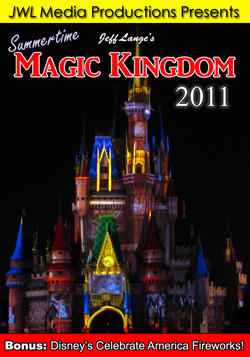 Cinderella Castle is in the background, and it’s a great vantage point! 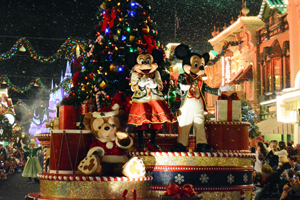 Mickey, Minnie and Duffy are on the first float (below, right). 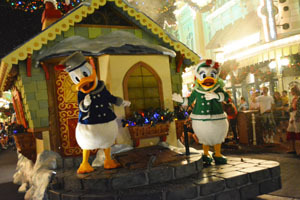 Scrooge McDuck used to be on this float (below, left), but this year it is Donald and Daisy (below, right). 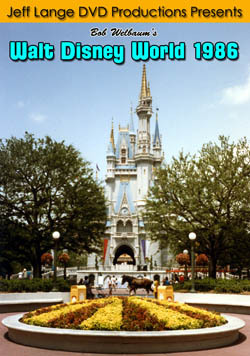 Donald and Daisy used to ride in a horse-drawn carriage (no longer featured in the parade). 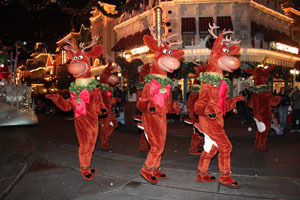 The traditional reindeer (designed by Disney Legend Bill Justice and approved by Walt Disney himself) that were in the parade and shows until last year at Walt Disney World (below, left) have now been replaced with Disneyland versions (below, right). 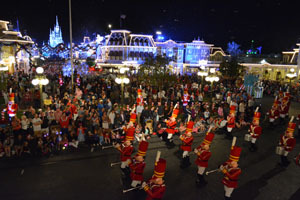 We enjoyed one parade from on top of the Main Street Train Station (below, left), which was a great location to view it from! 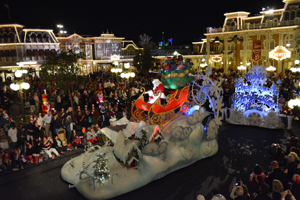 Some of the floats are a little higher – like Santa – and it was fun to see them in a different way (below, right). 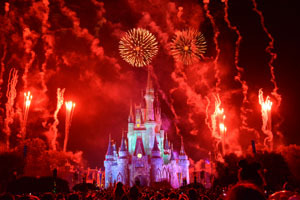 Video #4 – Mickey’s Once Upon a Christmastime Parade 2013, Mickey’s Very Merry Christmas Party – Magic Kingdom – Mickey’s Very Merry Christmas Party at the Magic Kingdom has kicked off for the 2013 season! 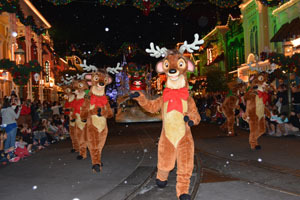 This is our video of the Mickey’s Once Upon a Christmastime Parade, which has a few character and costume changes this year including Disneyland style Reindeer! 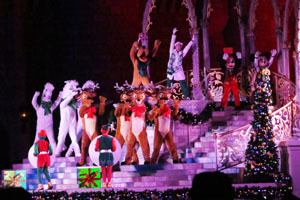 The “Celebrate the Season” show is very popular, and is performed in front of Cinderella Castle (below, left). 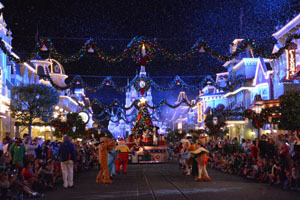 The show evolved from the former “Jolly Holidays” dinner show at Disney’s Contemporary Resort from the 1990’s (below, right). 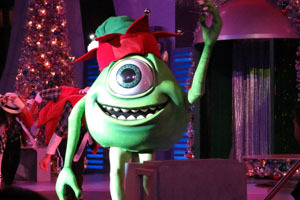 Mike Wazowski (below, left) is part of the “Totally Tomorrowland Christmas” show. 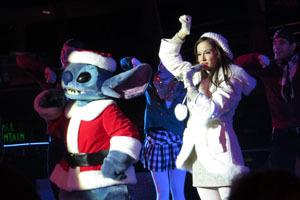 Stitch arrives at the end of the show dressed as Santa (below, right). We enjoy this a lot! 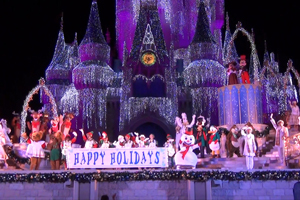 Video #5 – A Totally Tomorrowland Christmas Show at Mickey’s Very Merry Christmas Party 2013, Disney World – The Rockettower Plaza stage in Tomorrowland is the setting for A Totally Tomorrowland Christmas during Mickey’s Very Merry Christmas party! 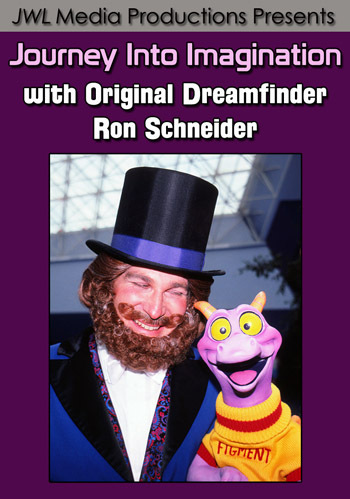 This is the full show from 2013 including special appearances from Mike Wazowski, Buzz Lightyear and Santa Stitch! 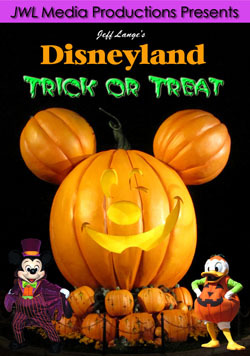 Treats are included with the admission ticket (below, left). 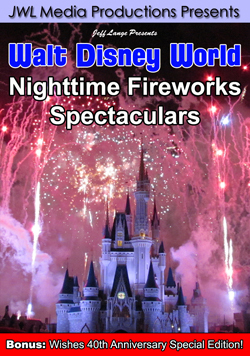 We always enjoy staying until the very end of the night after the park closes – usually around 1:00am! 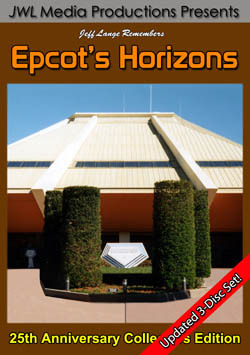 The shops close at midnight, as does the attractions. 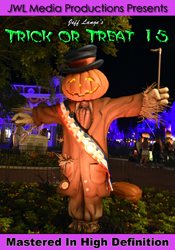 But some guests enjoy taking photos on Main Street when the Party empties out. 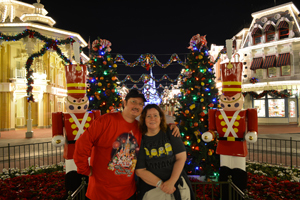 This photo would not be able to happen until after the Photopass photographers leave (below, right). 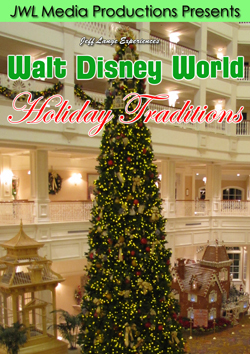 Video #6 – MouseSteps Weekly #78 Mickey’s Very Merry Christmas Party Overview & Tips 2013, Magic Kingdom – Our special Mickey’s Very Merry Christmas Party Full Overview, Changes & Tips 2013 show, plus a bit of party history thrown in too!